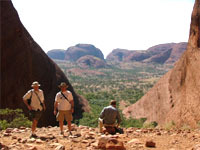 Ray Blackston (left) and fellow hiker Sandy Covington, hiking rock formations in the Olgas with their Outback guide, Phil “The Bushman” Taylor (seated). 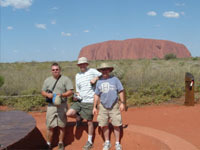 Three Carolina bachelors at Uluru (famous Australian landmark). Pictured (l-r) are: Matt Kunzweiler, Ray Blackston, and Sandy Covington. Okay, Ray, the obvious question is why did you choose Australia for the setting of book three? Actually, only the first two-hundred pages are set in Australia. The story does return to South Carolina eventually. The reason I went down under with these characters is twofold: First, I felt that I had fully explored the Southern singles scene in Flabbergasted and A Delirious Summer; and second, the arid and scenic geography of the outback seemed an intriguing backdrop for a guy with commitment on his mind. But something goes wrong in the midst of those plans, doesn't it? Very wrong. Suffice it to say that when “dumb Americans” attempt to negotiate a vast wilderness, it is usually best to hire a guide. Jay and Steve, however, are much too foolhardy to go on a guided tour. And their two girlfriends, Allie and Darcy? They're every bit as foolhardy. Foolishness has no gender preference. Tell us about the research you did for this novel. Well, when I found out that Qantas Airlines had some half priced roundtrip tickets from L.A. to Sydney, it didn’t take long to convince two buddies to join me for a journey to the outback. Matt and Sandy and I traveled for twenty-six hours to get from Carolina to Alice Springs, a little tourist town in Central Australia. There we hooked up with a veteran guide (Phil "The Bushman" Taylor of WayOutback Safaris) and set out for several days of exploring, hiking, cooking over campfires, and riding some ornery camels. Mine was named Mona. And this research helped you with crafting the novel? Yes, particularly the descriptive passages. Until you get there, you just cannot imagine how vast is the outback, and how dark orange is their dirt and sand. The sky there is a degree "bluer" as well, so it makes for great color contrasts. Also, in the United States you just don't get to see five-foot goanna lizards scampering across a dirt highway. When Phil jammed the brakes of our Land Cruiser and yelled "look at that one!," I thought that lizard was something out of Jurassic Park. You haven't mentioned the marsupials. Since your new novel is called Lost in Rooville, I thought you'd be talking about the kangaroos and wallabies. Good point. The kangaroos are wary of tourists, and tend to hang out in the more remote regions. The wallabies, however, were a different story. When we returned to Alice Springs after those days camping in the outback, the desk clerk at our lodge told us to wait for sunset and walk to the back of the property. There was a steep, rocky, 200-foot hill behind the lodge, so steep that it looked impossible for anything to scale it. But at sunset fifteen rock wallabies came hopping down the orange ledges of that hill, and as we stood at the base they kept on coming until they were only ten feet from us. It was "feeding hour." The lodge had some food pellets and we held them in our palms and those wallabies hopped over and ate right out of our hands. Again, you just don't get that sorta thing here in the States. So you'd highly recommend an outback trip? Absolutely. I'd go back there in a flash. Keep in mind that at certain times of the year the flies can be bad in the outback, but the scenery is fabulous, and the people of Australia are the most cheery and hospitable folk on planet Earth. Nashville, Tenn., February 23, 2004 – Award-winning, critically acclaimed novelist Ray Blackston offers A Delirious Summer as the highly anticipated sequel to his popular novel, Flabbergasted. The new book, (0-8007-5958-3, $12.99, paperback) releases May 1 from Revell, a division of Baker Book House. Launching with that momentum, A Delirious Summer picks up where Flabbergasted left off. In his second entertaining “beach read” full of quirky characters looking for love in all the wrong places, Blackston hilariously develops characters introduced in the first book, as well as the new narrator, Neil Rucker. Neil is a dateless Spanish language teacher to missionaries in Ecuador, whom Jay Jarvis sends to South Carolina for his furlough. He's looking for romance, only to discover the church-hopping girls of Greenville, SC are “more elusive than a snowflake in the Ecuadorian jungle.” Neil tries to find the perfect girl among the Neapolitan choices: Lydia, a demanding redhead, Darcy, a joyriding picture-perfect blonde, and Alexis, a very tardy but intriguing girl with raven hair and a pierced eyebrow. The novel also boasts more convertibles, beach music, and even a little Elvis. With Family Christian Stores, Parable, LifeWay and other Christian retail outlets already pre-ordering numerous copies of A Delirious Summer, as well as the paperback version of Flabbergasted, mainstream outlets are further making Blackston’s books a focus of their summer campaigns. After last year’s sales success with Flabbergasted, Wal-Mart is picking up the sequel’s merchandising kit and using it for their summer reading promotions nationwide. Target has also committed to a substantial retail promotion for both books, marking the first time for Blackston’s books to be featured in the retail chain. Major promotions for the book are also being implemented at Books-A-Million, Barnes & Noble, Hastings and more. Supporting retail efforts is a significant marketing campaign consisting of key catalog placement, advertising, advance reading clubs and a national publicity campaign. In addition to the printed novel, A Delirious Summer will release simultaneously May 1 on CD and cassette tape through Oasis Audio, a division of Domain Communications. Hailing from Greenville, SC, Blackston worked as a buyer and a broker for eleven years before cashing in his modest 401K and leaving his corporate cubicle to write full time. Humorous now in hindsight, but before signing with Revell he had been turned down by every publisher he approached with his first book, each saying that “no one would want to read a book about singles and their volatile dynamics.” Thousands of books later, Blackston has now begun the third novel in a loosely connected "Flabbergasted Trilogy." Nashville, Tenn., May 1, 2003 - The already award-winning, critically acclaimed novel from Ray Blackston, Flabbergasted (0800718372, $22.99, hardcover), releases today from Revell, a division of Baker Book House. Remarkable for any author, especially for a first time author, the widespread support from retailers and media compelled a third printing of this novel even before it officially released. Humorous now in hindsight, but before signing with Revell, Blackston had been turned down by every publisher he approached with the book, each saying that "no one would want to read a book about singles and their volatile dynamics." As early review copies of Flabbergasted were sent to select retail buyers, orders began pouring into Revell by the thousands. Major promotions for the book are being implemented at Books-A-Million, Barnes and Noble, Hastings, Family Christian Stores, LifeWay and more. The Crossings Book Club also picked up the book as a main selection. A Crossings Book Club reviewer heralding the book exclaims, "If you only read one novel this summer, let this one be it!" Other retailers similarly herald the novel. "It was definitely unlike any book I have ever read," says Pam Gentry, The Open Door (Terre Haute, IN). "I found it intriguing and original. I had only read just a few pages when I was drawn into the life of Jay and his new-found friends." Bonnie Monson, Family Christian Stores, #137 (Chesapeake, VA), called Flabbergasted an "entertaining novel that had at the heart of it a soul-searching theme…recommendable to both males and females." Following its recent cover feature in New Releases magazine, Southern Living also plans to review the novel in August, with additional coverage slated in the Fort Worth Star Telegram, Outreach Magazine, Lift Magazine, Christian Retailing, Birmingham Christian Family, Pee Dee and many more. BookPage echoes the enthusiasm, "Blackston's light and breezy style makes Flabbergasted an ideal reading choice for a lazy summer night." "A narrative in three acts, the humorous odyssey in Ray Blackston's superb first novel unfolds through the eyes of stockbroker Jay Jarvis," says Christian Retailing. "Underlying Blackston's story is the theme that God is in control, planning behind the scenes what we often perceive as detours, and leaving us flabbergasted at how He weaves unadorned surprises into life." "Everything about this book grabbed me," says Leigh DeVore, Charisma and Ministries Today assistant editor. "I will be recommending it to all my friends." All this enthusiasm and support is being given to an unproven, first-time author whose previous vocation was as a financial analyst. Sometimes Providence changes the course of troubled souls. In 2000, burnt out in the corporate cubicle, Blackston quit his daytime job in Greenville, SC, and decided to pursue the craft of writing. This decision was based partly on the encouragement of his second grade school teacher. Cashing in part of his 401K, the newly determined author gathered richly from his life experiences: as a single, as summer missionary to Ecuador, as financial professional and as planner of frequent beach retreats, then brought to life the fictional characters in Flabbergasted. Lead character and single stockbroker, Jay Jarvis, narrates the adventure. Jay is the slightly irreverent spoon who stirs the relational gumbo, a stew of quirky characters who, over the course of the narrative, begin to stir back. In the process they change his perceptions of church and of God, culminating in events that leave Jay, and those around him, thoroughly 'flabbergasted.' The supporting cast of off-beat others includes Jarvis's love interest and missionary girl, Allie; Nancy and the Numericals; surfer-dude Ransom; Bible-thumping Stanley; and Allie's best friend Darcy, whose lime-green convertible graces the cover of the book.